The latest version of Google Earth is available for download. Read all about the new features on Google Earth Blog, OgleEarth and Lat Long. Personally, I am stoked about this release for aesthetic reasons (hey, eye candy is important). With the sun and 3D building features, the world looks so much more realistic and beautiful in this version. You may have also noticed that the atmospheric rendering is improved, making views around the world quite lifelike. Previously an easter egg, the flight simulator now is available by default in the Tools menu. 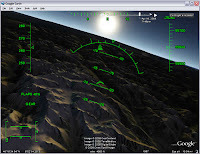 You can fly to some gorgeous views by using the flight simulator and sun feature. Try setting the sun to appear on the horizon, at dawn or sunset, and fly over the Swiss Alps. I should also mention that I've created a new section of the user guide devoted to the flight simulator feature. I had to unistall 4.3 and go back to 4.2 because links wouldn't open in my browser. They would fine inside of GE but if I checked the option to open links in my browser it wouldn't do anything. After uninstalling it and re-installing it 2 more times I finally gave up and re-installed 4.2 and now links open just fine. I noticed what appears to be accurate stars in v4.3 (in earth mode, not sky). Looking north with atmosphere turned off, and the sun time slider running, the stars rotate around what appears to be the north star. I'm not much of an astronomer, but I was able to pick out the big dipper. If you're unable to duplicate, let me know and I'll try and send some screen shots. Is this new?? This a step backwards for me! Please give me back my old Google Earth - you can keep the $80.